Travelers passing through Hobby Airport will enjoy new eye candy showcasing why Houston is affectionately dubbed “Space City.” This week, installation of a new exhibit comparing two generations of spacesuit design will help connect NASA’s iconic past to Johnson Space Center’s next giant leap. On the left of the Hobby Airport display, visitors will see a high-fidelity replica of a shuttle-era spacesuit, right down to the NASA “worm” logo. On the right is an identical counterpart to the suit used today on the International Space Station. For passing visitors, the exhibit serves as a bold welcome to Space City USA, symbolizing Houston’s leadership role in human space exploration. For curious travelers with a few moments to spare between flights, they will discover an evolution of engineering. Assembling the display required a close working relationship between ERO and the EVA Office to get the details just right. While the ERO provided creative direction and craftsmanship to build the exhibit and safeguard the priceless artifacts within, the EVA Office was invested in ensuring the accuracy of the spacesuits and content, as well as finding the perfect home for the display. 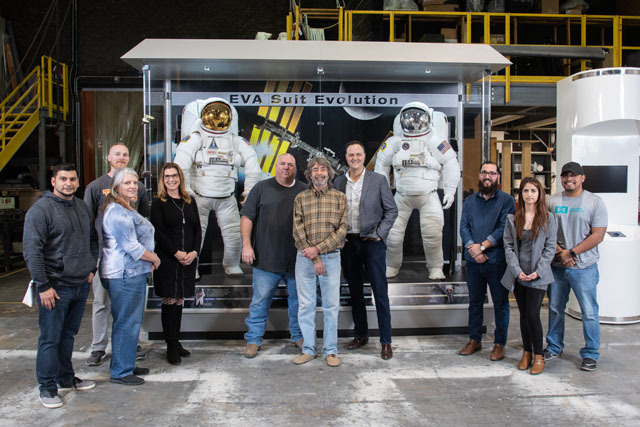 The EVA Office was over the Moon about the finished display and recognized the entire Exhibits group in the weeks leading up to installation at Hobby Airport. While travelers taking to the friendly skies will be swept into a 3D visualization of explorers who have donned these types of spacesuits to explore even higher trajectories, there are still other stories to be told. The Moon is center stage once more, and generations young and old are waiting to be a part of NASA’s next big adventure. The Hobby Airport exhibit is only one example of how we can highlight the important work done every day to support humans in space. As Moore explained, the team works with many organizations throughout the year to create exhibits that share the many facets of the center with the public. “We have an incredibly talented pool of designers, craftsmen, project managers and writers waiting to start the next exciting project,” Moore said. Have an idea for an exhibit that could inspire generations about your specific area? Start here.